God destroyed the earth in Noah’s day because of sin. Now God is moving and going toward His plan to re-create the entire universe, both nature and humanity, to make it as He has wanted it to be all along. Yet what He envisions has no previous appearance. 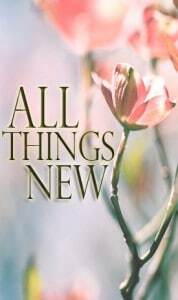 The “all things new” will be without precedent or even a hint of anything former or old. It will be as He is, entirely “other” than our ideas, beyond our capacity and in essence, what we can only glimpse in scripture and anticipate as a totally mysterious wonder.